For the first time in what seems like years, Kristen is back with a recipe. All I can say is: welcome back Sonic. We’ve chosen one of my favourite styles. Well, favourite since I invented it a couple of weeks age. English Watery IPA. 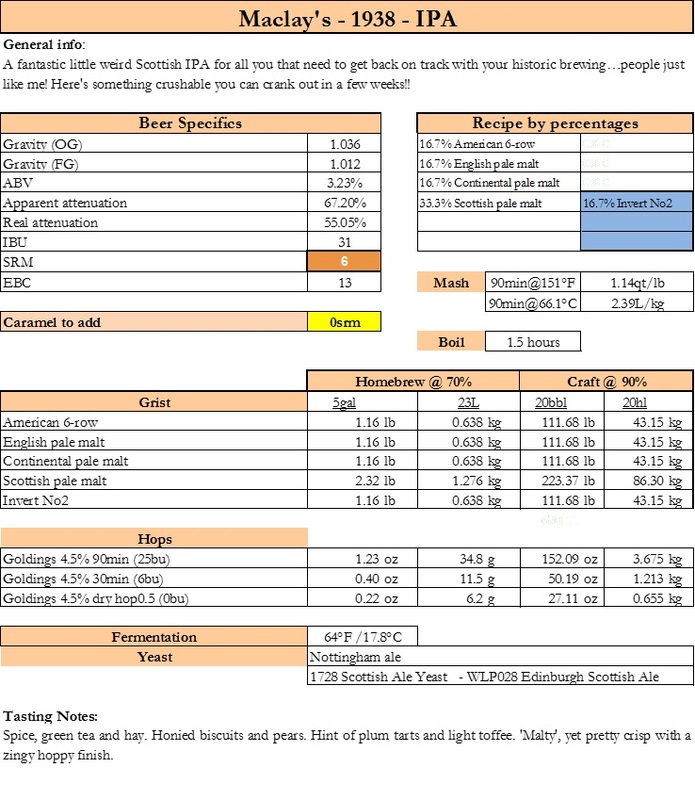 It’s amazing how many more beers fit my definition than the official BJCP English IPA guidelines. Maclay’s records are some of the dullest around. Because they mostly only had one recipe, from which they’d parti-gyle four beers. In the 1930’s these were IPA 5d at 1032º, IPA 6d at 1036º and IPA 7d at 1042º and Strong Ale at 1075º. They were still brewing the first three 50 years later, to a similar recipe, just with the gravities 2º lower. Though by then they were marketed as 60/-, 70/- and 80/-. Effectively this is a pre-war 70/-. 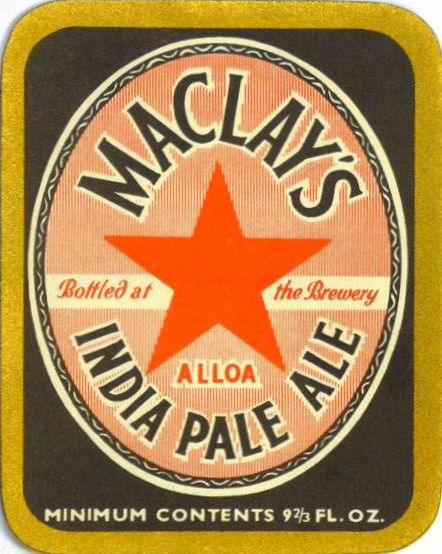 Maclay are typical of every Scottish brewery I’ve looked at, with the exception of William Younger. They all had three different strength Pale Ales and perhaps a Strong Ale, depending on the period. After WW II, virtually nothing but Pale Ale was brewed in Scotland. And Lager, I suppose. Scottish brewing was much less interesting than it appeared from the outside. The attenuation is pretty crappy, but that’s Scotland for you. The Scottish practice of having the FG of all Pale Ales very similar, whatever their OG is partly to blame. In general, the stronger the beer, the greater the degree of attenuation. I suppose that it’s all about body. If you want to go full Scottish, you split up the batch and colour each up differently with caramel. Then get friends to try them without saying it’s the same beer and see which they like best. You can colour up from as brewed to around 25 SRM maximum. And with that, it’s over to Kristen . . . .
Notes: Holy crapfilled buckets. Talk about a busy year. I moved, got thinner, then fatter, then thinner, and many other excuses kept me from doing more of these last year. Not just kept from writing, but kept from bloody making! Seriously. I only made a handful of historic beers at the brewery last year which is damn sad. But it changes now. Today. I mean yesterday. Just made a version of this beer yesterday. It felt good. It will be on tap in the next few weeks. Should be fun. Why this beer? Well, frankly, we gotta start somewhere and this beer is weird, for an IPA. The Scots, always the weird ones. Such a small dose of dry hops. When I said I brewed a version of this for the brewery, this is what I meant. I’ll probably end up adding more dry hops in but we’ll see. Its your beer, you do as you like, but don’t be silly. Actually, I’m turning over a new leaf. Be silly and put in the dumbest things you want. Dry hop with 8g/L. Use a Belgian yeast. Make a batch, open a brewery, use this beer. Make sure and say its traditional, no matter what you do to it. I’m sure it will be great. Actually, I’m turning over a newer leaf. I’m going to be fueled by rage, caffeine and alcohol this year. 2017 is the year of the Rage-O-hol…and rye, in whiskey, not beer, don’t be silly. Wait, be silly. I don’t listen to myself often. Seriously though. Yous gonna need to drink an awful lot of this beer to get that alcohol fuel…which is perfect for getting your maladjusted expletive-strewn sense of self-righteousness aligned (e.g. temet nosce)…and plenty of room for some nice Rittenhouse. Malt: An American malt, English, Scottish and Egyptian. Yes, Egyptian. So if you have some Egyptian, use it, as it would be sweet and I don’t know anyone that has every used any. Most important, is choose a nice blend of whatever you’d like. This one isn’t so much about the malt as it is about the invert. Most of you haven’t used as much invert in this small little recipe in a whole year, let alone one recipe. Buy it if possible. If not, make it using the dilution method (http://www.unholymess.com/blog/beer-brewing-info/making-brewers-invert). I suggest the dilution because I’m frankly sick of people coming up to me and arguing that a beer is supposed to taste a certain way when they’ve cocked it up completely by trying to make invert sugar and then convincing all their friends it tastes great and having them email me to yell at me. Again, do what you’d like, it’s gonna be great. Hops: To keep the same tannic grip this will have make sure and use some lower AA hops in the kettle to get your ‘greens’ up. You see the tiny amount of dry hops. Follow it…or don’t. I wouldn’t do more than 1lb/bbl (~4g/L) though. I’d suggest half that if you want to make it bright without destroying the balance of the beer. I like Styrian goldings for this. Nice and bright ones…or any of their variants…Celeia, Bobek, etc etc. Have fun with it. Also, please note that there are these things called scales. You can buy a certain unit (1oz, 5kg, etc) and not have to use it all. You’ll be surprised home many brewers, including pro-brewers, that add hops based on ‘units’ and never even think about how the beer would change if they stopped using whole numbers. Do so, use bits of a number. I can tell you from experience, a beer I do with 2.7g/L dry hop is completely thrown out of balance at 3g/L. It’s the little things. Care about them. Or don’t. I’m sure it will be fine. Yeast: Really any mostly neutral yeast will do. If you want to play around with a newly offered not POH+ yeast, do so. I’m using a nice Courage yeast. I really like the fruit and the finish. 6) Bung it up and roll it around to mix. Condition at 55F or so for 4-5 days and its ready to go. Spile/vent. Tap. Settle. Serve at 55º F.
Were the 1.032 beers really sold in half pint bottles? yes, they were mostly sold in halves. I've even seen beers this weak in nips. Great to see Mr. England back. Hope he sticks around. Any thoughts on how to achieve that famous Scottish low attenuation? It's great to have you back, Kristen. You and Ron make an awesome team. Any idea why Scottish beers have consistently low attenuation? it seems deliberate as they sometimes made beers with more normal levels. I think they just wanted beers with a lot of body, whatever the OG. Interesting. I wonder how they did that. Different yeast strains? If you are in the Minnesota area, I just put this on tap at the brewery (Bent Brewstillery). 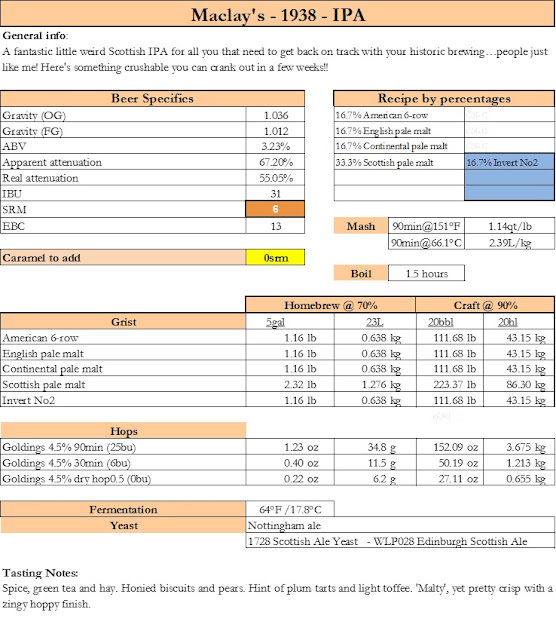 It ended at 3.8% and I added a bit more dry hop because frankly, I have to sell it. If you're around, let me know what you think. Well, had one last Friday. Holy crap. A *bit* more hops? It was good, but as a session IPA, I don't think I could handle more than one.